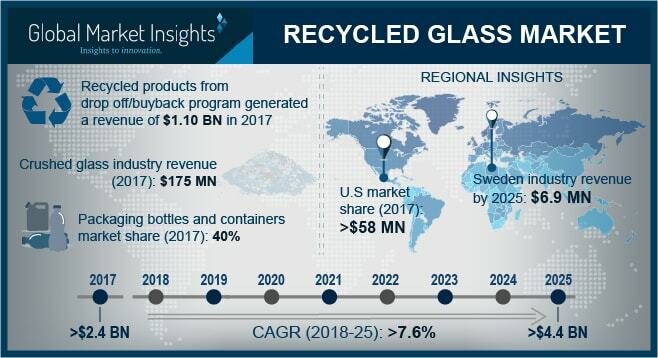 Recycled Glass Market size will surpass USD 4.4 billion by 2025; according to a new research report by Global Market Insights, Inc. Recycled glass is a sustainable material providing boundless ecological aids including contribution to mitigating climate change and saving valuable natural resources as vitric products can be recycled in close loop endlessly. On an average, the glass bottle has a recycling rate of 50% to 80% which conserve a significant amount of raw material. The use of product during the manufacturing of vitric products will also conserve the energy consumption as the cullet melt at a lower temperature than raw material. Consequently, low energy consumption is required for melting purpose. Increasing demand for the use of vitric products will fuel the recycled glass market owing to the inert property which preserve taste and nutrients of the food and beverage product. Additionally, it is also used in pharmaceutical industry to preserve the medicines composition and properties which will increase the demand of vitric products and further spur the recycled glass market. In current years, legislative pressure and improvement in cullet quality have significantly influenced the recycled glass market. For instance, The Producer Responsibility Obligation Regulation in Europe introduced Packaging Recovery Note (PRN) system which made product market more economically attractive. The combination of above mentioned regulation with Climate Change Levy has made the lower energy requirements of using cullet as a raw material in place of virgin materials which act as a key factor in reaching industry targets for reducing energy consumption. Moreover, the Pollution Prevention and Control legislative in Europe targets to reduce pollution which bounded the glass companies to increase the use of recycled product, which will fuel the recycled glass market by the end of 2025.